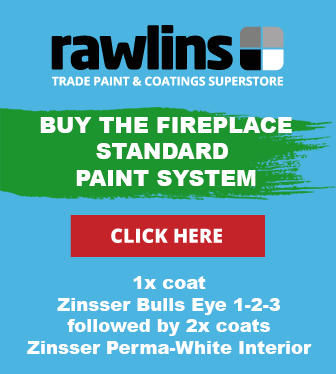 Within this post Rawlins Paints will be looking at common problems faced when painting fireplaces and around multi-fuel stoves. It is these problems that can make picking the best fireplace paint a tricky task, but don’t worry, we’ve some advice on using flame-retardant systems too. When you’re installing anything that involves fire, you need to think about preparation and safety. A fireplace can make a stunning addition to any room, adding instant impact and a homely feel. Not to mention you’ll be cosy! Multi Fuel Stoves are also a very distinct type of fireplace, which make a statement in any living room or entrance hall. Before starting your fireplace project, it is important to check your fireplace is suitable for the stove you intend to buy/have installed. If you are using a professional installer for a new stove, they should advise you on which stove to buy and what regulations must be met for your property and fireplace. If you want to get a heads up on what is involved or you are attempting to install it yourself, take a look at this article on Building Regulations for Fireplaces. Once you’ve chosen your fireplace and stove and you’re ready to install or whether you’re just thinking about updating an existing fireplace and stove, you may be thinking about painting the walls around the fire. Fire safety is important whether it’s your home or workplace so you need to take all the preventative measures possible. Fireplace recesses can’t have anything combustible in them, so materials like stone and brick are fine but if you want that smooth plastered finish you need to make sure you use special fire and flame retardant versions of the board and skim. Painting your recess creates additional problems. The area immediately surrounding your fire will get hot when the fire is in use. This will discolour normal paints and eventually cause them to crack, flake and peel off the surface. Heat resistant paint is available at Rawlins Paints, but generally only in black and silver colours – not always the colour of choice for a homely and welcoming fireplace surround. Another issue is neither the conventional paints nor the heat resistant paints are fire retardant. Heat resistant paints are coatings that can withstand high temperatures, up-to 750°C, and are most commonly used for BBQs, chimneys, pipes, vehicle exhausts, and other metallic items. Unfortunately, fire retardant paint is not ideal either. 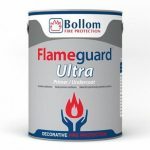 These paints are designed to react in a fire to protect the surface they are applied to and once they have done their job they must be removed and re-applied to ensure protection is maintained. Under increased heat from a fire, fire retardant paint will discolour, as they are for safety in event of a fire and not decoration after the effect. Fire retardant paints generally work in two ways, when controlling the spread of flame on a surface (BS Class 1/0) the most common technology is for the coatings to emit a vapour when they encounter increased heat (usually above 180°C) from a fire. The job of the paint is to react to the fire for safety purposes and slow the spread of the fire down, not act as a heat resistant/high temperature coating. The other is intumescent coatings, these products provide 30, 60, 90 or 120min protection to their substrate and are available for use on wood, steel or plasterboard/lathe & plaster. They work by intumescing (swelling up like an expanding foam) to deal with the fire and protect the substrate (walls, doors, etc.) for the defined length of time. 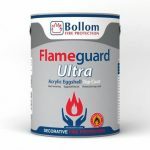 These coatings do provide a degree of insulation from heat and guarantee to keep the surfaces they are protecting safe from the effects of the fire until the stated protection time has elapsed. If the stove has not been fitted correctly, it is not advised to decorate around the fireplace with a product unsuitable for the task, like those described above. If it has been correctly fitted by a professional (check with your landlord if in doubt), there are some products that will do the job. The best advice we can give to paint fireplace recesses is to not do it if you are unsure whether the stove has been installed correctly, but if you know it has been, we suggest using a flame retardant topcoat. These types of products are used to finish fire retardant paint systems and come in most conventional paint finishes – matt emulsions, eggshell, gloss, etc. and can usually be bought in a wide range of colours. By using a flame-retardant topcoat you can decorate the area safely. Although they are not heat resistant, they will withstand temperatures up to around 70-80°C comfortably and you can be safe in the knowledge that you are not painting the surface with something combustible. 1x coat of Zinsser Bulls Eye 1-2-3 followed by 2x coats of Zinsser Perma-White Interior. 1x coat of Bollom Flameguard Ultra Primer and Undercoat followed by 2x coats of either Bollom Flameguard Ultra Vinyl Matt or Bollom Flameguard Ultra Acrylic Eggshell. 2x coats of Thermoguard Wallcoat Smoke and Flame-Retardant Topcoat. 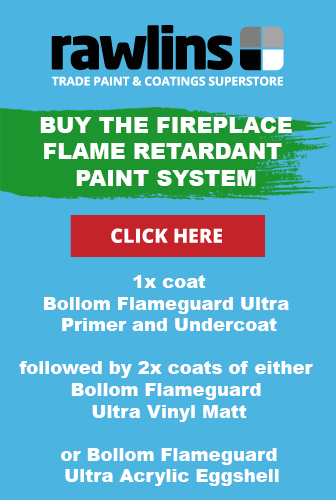 If the flame-retardant topcoat becomes discoloured over time or it reacts to the fire, you can simply clean, prepare the area and re-paint as and when required. Comments for this post have now been disabled. 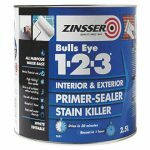 In answer to your question – Clean surfaces with Zinsser Universal Degreaser & Cleaner and then prime with 2 coats of Zinsser Bulls Eye 1-2-3 Plus. Once dry, you can then use any of the paint systems recommended above in this blog post obviously minus any primer/undercoats recommended as you’ve already completed this stage with the Bulls Eye 1-2-3 Plus. Our gas fireplace has a masonry firebox that was painted in a matte black several years ago. The paint is now lifting, cracking and peeling. What do you recommend to repair the backing? We’ve been in our home for 2yrs now. The prior owner painted the inside of the fireplace white. I have no idea if the paint is fire retardant. I recently had a gas line put into the fireplace and I’m ready to use it for the 1st time. I was wondering if leaving the white paint would be ok or should i take it off and replace with fire retardant paint. Or maybe I can paint over with fire retardant paint. Please let me know what you recommend. 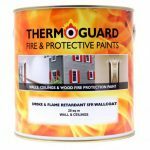 Using a flame retardant paint system like Thermoguard Wallcoat followed by Thermoguard Wallcoat Smoke & Flame Retardant Topcoat would help improve from a safety aspect but isn’t heat resistant so would still discolour/potentially react if the temperature got too high. The hearth in our house has got discoloured and I would like to paint it. We have an inset wood/coal burner that sits partly on the hearth. Can you suggest what I might use? So many stone paints seem to be for surrounds rather than for a multi fuel burner. The above information in this blog post is applicable to any area surrounding a multi fuel burner, whether its walls, ceiling or floors (hearths included). 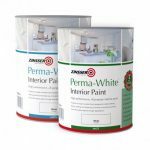 The 1 x coat of Zinsser Bulls Eye 1-2-3 followed by 2 x coats of Zinsser Perma-White Interior we recommend in the article above would adhere well to the surfaces you have mentioned and will cope with temperatures up to 70-80°C. Hi, we are having a multi fuel stove fitted in a corner of our bungalow. They are putting fire board on the walls around the stove that’s white/cream in colour. They have said we can paint it to fit in with the decor. Which paint do you recommend please? Click to view any product above and its full colour range is there, along with more in depth product descriptions and data-sheets. Heat resistant paints (available HERE in black or silver) are primarily designed for metal surfaces. If your timber surround is getting hot then this could be a potential fire hazard and heat resistant paints don’t prevent the underlying surfaces they are applied to from getting hot. As you’ll see from the article above, we suggest a flame retardant topcoat is used to decorate fire surrounds but these are not available in silver and would rely on the surface not getting above a certain temperature. We have a log fire in our living room..we have only used it a handful of times. We never used to have any problems with it until we painted the wall around it with a mould resistant paint as we was getting a bubbling yellow mould type thing on the walls around it. Ever since we done this, when lighting the fire and once it gets hot it gives off a very strong plastic burning smell…could this be caused by the mould resistant paint we used? Also, could this be the reason for the yellow bubbling on the walls? I love using the fire but the smell is rather strong so can’t use it. Yes the smell most likely is the paint. From what you have said the fire has not been installed correctly in the space it is in and is getting the surrounding walls and surfaces too hot, this is also the most likely cause of the yellow blistering of your first paint (not mould). The fire is heating up the painted surfaces and causing them to discolour (yellowing) and then getting so hot the paint is blistering. The new paint you’ve used is obviously suffering from the same but the smell most likely will be because the paint is newer and being mould resistant probably has some additional contents to combat mould that may be giving off the smell under extreme heat. Not a good situation and you would be advised to not use the fire again until all paint has been removed back down to a bare substrate. We would then suggest getting a professional local installer out to check the installation of your fire and its surrounding to advise on a steps that need to be taken to make it safe to use again. I have a bio-ethanol fireplace that sits inside a large letterbox cavity in a converted brick chimney. The interior is built from fire-resistant cement board with marble tiles on the back, but we have used fire-resistant plaster from VITCAS on either side. The heat-resistant paint I have used so far seems to be absorbed into the plaster leaving a disappointing finish. Can you recommend a primer suitable to be painted onto the fire-resistant plaster that can then be painted over afterwards with heat-resistant paint? Hello. Which of your paints would you recommend painting onto heat-resistant plaster for use with a bio-ethanol firebox? Would Blackfriar High-Heat Resistant Paint be sufficient for the bare heat-resistant plaster? In response to both of your questions, if we understand the enquiry correctly, it is the plaster not facing the stove which needs to be painted. The most suitable paint for this sort of situation depends on the temperature the plaster will get up to during use. If you can touch the plaster safely without burning yourself then the Blackfriar High Heat Resistant Paint would not cure as it needs to get up to 250°C to fully harden. If the plaster gets quite warm but you can still touch it then Zinsser Bulls Eye 1-2-3 RAL 7042 Traffic Grey can be used to prime and seal the surface followed by 2 coats of a durable satin black water based finish such as Zinsser AllCoat Exterior Satin in Black. Is there any paint that can be used to withstand occasional use of a fire pit? Rust-Oleum Heat Resistant Paint 750°C would be our best recommendation for this, it isn’t guaranteed to work as we have no prior experience of it being used in this way but from the information we know about it we feel it would have a good chance of working with occasional use. Hi , I’ve got a log burner that sits in stone and is flush with the wall ( not in the wall) will these paints be okay to paint all the stone surroundings with the log burner ? The burner can get up to 550 degrees. You will have to use one of the heat resistant paints for this sort of temperature, something like Blackfriar High-Heat Resistant Paint should be OK to use but we would recommend testing a small area first to ensure you are happy with the appearance. Hi. We had a 70s style tiled surround and hearth to our fireplace and we have had the hearth removed, slate laid and a woodstove fitted. The original tile surround is still in place and the stove sits in front of it. We’d like to paint it to match the slate we have. Can you recommend a paint for this? 1 x coat of Zinsser Bulls Eye 1-2-3 followed by 2 x coats of Zinsser Perma-White Interior as described about would be suitable to change the colour of your tiles as long the areas painted didn’t exceed temperatures of around 80°C. Zinsser Bulls Eye 1-2-3 won’t block soot and residues from fires, Zinsser B-I-N is the one to use. Remove as much loose soot as possible by brushing using a stiff/wire brush and vacuum up the dust, then apply 2 coats of Zinsser B-I-N. Note It is advisable not to wash the surface as you will then have to wait for any dampness to completely dry out before applying the Zinsser B-I-N. If Zinsser B-I-N is applied to a damp surface you can get staining coming through the primer. Please let us know how you get on, Hazel, and if there’s anything else we can help you with, don’t hesitate to contact us. Many thanks for the quick reply and advice Mark. The surface I need to apply it to is the walls of the chimney and although not in contact with the wood burner stove will be quite close to it so I would imagine get quite hot. Would it still be okay to use Zinsser B? Thanks, Hazel. Firstly thanks for your informative post and time taken to answer the many questions you have been posed. My circumstance is that with the purchase of a property I have inherited a slow combustion heater that is installed in an existing brick fireplace. The heat coming from the fire is immense and it is heating the paint on above it, emitting a noxious smell. I am certain it is standard low quality house paint that has been used. difficulty of removing the paint stripper from masonry inside a home. Could you please advise if there are any products you would recommend. Thanks for your comment. We’ve discussed this question among the team, and unfortunately there is nothing we currently stock which we could recommend. We’re sorry we couldn’t help you with this matter, but nothing we currently stock is suitable for the task in hand – and due to that, there’s nothing that we are aware of to recommend for this situation. I hope you get this sorted before the colder seasons. Apologies, and all the best. We have a gas stove (free-standing fireplace) and I touched up the top of it with regular rust-oleum black spray paint. Should I remove this, and if so how? Or could I repaint it with a rust-oleum heat resistant or flame-retardent paint? We would recommend removing by abrasion and then using a heat resistant product. I’ve installed a wood burner stove into a fireplace recess which is lined with Skamolex boards. I would like to paint these boards. Which of your paints would you recommend ? 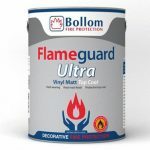 Something like Thermoguard Wallcoat Smoke and Flame-Retardant Topcoat would probably be best for you assuming the Skamolex is a type of Vermiculite Fire Board. Obviously the above points raised in this post still apply and should be read and understood before proceeding as it’s not guaranteed to be suitable for your situation. we are knocking through under the stairs to bring the space into the room and are putting a multi fuel stove within the old space – so under the stairs with the slopping ceiling above the stove. At the moment we have plaster board on the walls and ceiling, can we paint the wall behind and ceiling with fire proof paint or would you recommend fire proof plaster board? This would certainly be a job for fire rated board instead of paint, but we would advise requesting a visit from a local authority to advise on your situation as positioning a multi fuel stove under a means of escape would not be recommended. We had a Tiger wood burner fitted in May. When we use it the room it is is fine but my son’s bedroom which is above smells.He has the original fireplace in which we have got an chimney balloon in .But the back bricks of the fireplace recess I painted with black bitumen paint. Is it possible that these areheating up when the fire is on to make the smell? It does smell tarry and there is no smoke in the room…and I did put cO monitor in and it didn’t react…Thanks. Our advice would be to seek out local expert advice immediately – it does sound like it might be the bitumen smelling, but before you use the fire again you should have is professionally inspected to rule out any risk to health and property. We hope that you can get this problem resolved quickly and smoothly. Hi i have multifuel stove, back wall is exposed stone, sides have been plastered and painted, i want to paint the back wall, either seal the stone or bond it put sand and cement on and paint it, can you advise? I’m afraid that we don’t have any suitable products for the full task you describe. We can advise on paints and coatings covered in this article, but not on the underlying sand and cement/continued renovation work. Sorry that we couldn’t be of more help at this early stage. Ok thanks,if i stabilise the stone what do you advise to paint? We have had an LPG stove fitted in our Bungalow, the Decorator has papered inside and behind Stove and emulsioned , when the fire is lit we are getting an unusual smell, my Husband thinks is the paper getting too hot, would heat resistant paint do the trick or would you recommend the paper to come off. Yes, the paper must be removed. Please do not try to cover the paper with a heat resistant paint. If you require some advice on decorating safely around the stove once the paper has been removed, please keep in contact here or on our Facebook page. I really must stress that you cannot simply paint over the paper, and that it must be removed.